Native Plant List Coming Soon! Join us for our seventh annual Bringing Nature Home Native Plant Sale! More that 150 species of native perennials, trees and shrubs will be available for sale. 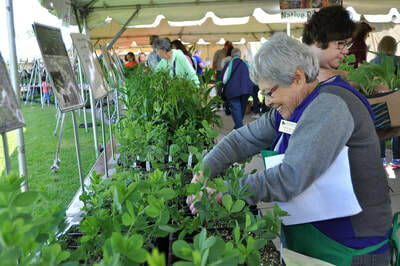 Native Plant Experts will be on hand to help you select your native plants and a variety of exhibitors and vendors will help you explore the many benefits of planting with native species. Make sure to stop by our new Pollinator Station this year and discover the importance of pollinators such as bees, bats, and butterflies. Learn more about these amazing animals and what plants are best to provide food and shelter. Learn which trees, shrubs, perennials, and annuals attract them and what’s best for your home landscape. Displays, a selection of informational handouts, and free milkweed seeds are available. Just Announced...Grumpy Gaucho will be on site Saturday with their food truck serving up their amazing selection of empanadas...and...they will be donating a portion of proceeds to The Nature Foundation of Will County! Did you know that you can beat the Saturday crowds & make a difference? ​The Pollen Path will be on hand selling their hand-crafted bee houses and hummingbird feeders. Each one is hand-made and unique. The Illinois Natural History Survey Traveling Science Center is a 320 square foot mobile classroom featuring informative, engaging exhibits on biodiversity and natural resources. Order your rain barrel and pick it up at the Native Plant Sale, Saturday, May 18 between 9am and 1pm. In cooperation with The Conservation Foundation and UpCycle, we are offering pre-orders for rain barrels with pick up at the Native Plant Sale on Saturday between 9am and 1pm. Order your rain barrel today! Rain barrels are an efficient and low-cost method to reduce the amount of storm water runoff from your property and save money on that water bill! Modern rain barrels are sealed, safe around children and insect resistant – they can even be painted or decorated to your liking. You can divert water from your downspout to fill your rain barrel and a hose spigot on the front makes the water easy to access and use. ​Around 40% of total household water used during the summer months is for watering lawns and gardens. Rainwater doesn’t contain chlorine, lime or calcium which makes it ideal for watering your flowers and vegetable garden or washing your car or windows. ​This event would not be possible without the generous support of Enbridge, Brent Hassert Consulting, Inc., Christopher B. Burke Engineering, Ltd, Kavahagh Grumley & Gorbold, LLC, Liberty Creative Solutions, Mahoney Silverman & Cross, Strand and Associates, Wight and Company, Possibility Place Nursery, the Forest Preserve District of Will County, and a host of talented and dedicated volunteers! Photographs courtesy of Glenn P. Knoblock, Denise Steffen, Ralph Schultz, and Cynthia Harn. ​Restoring native plant habitat is vital to preserving biodiversity. By creating a native plant garden, each patch of habitat becomes part of a collective effort to nurture and sustain the living landscape for birds and other animals. "Our studies have shown that even modest increases in the native plant cover on suburban properties significantly increases the number and species of breeding birds, including birds of conservation concern. As gardeners and stewards of the land, we have never been so empowered to help save biodiversity from extinction, and the need to do so has never been so great. All we need to do is plant native plants!"